Visit any biology or chemistry laboratory and you will probably find one: a chemical fume hood (CFH). Drawing air from the room, fume hoods vent harmful gases generated during lab experiments away from the researcher and out of the work space by way of the building’s heating, ventilation, and air conditioning (HVAC) systems. Although essential for safety, this removal of conditioned air can dramatically drive up energy consumption depending on the fume hood type (constant vs. variable air volume) and average sash position (open or closed). For example, leaving the sash open on a variable air volume (VAV) fume hood is comparable to heating your home in the winter while the windows are left open1. 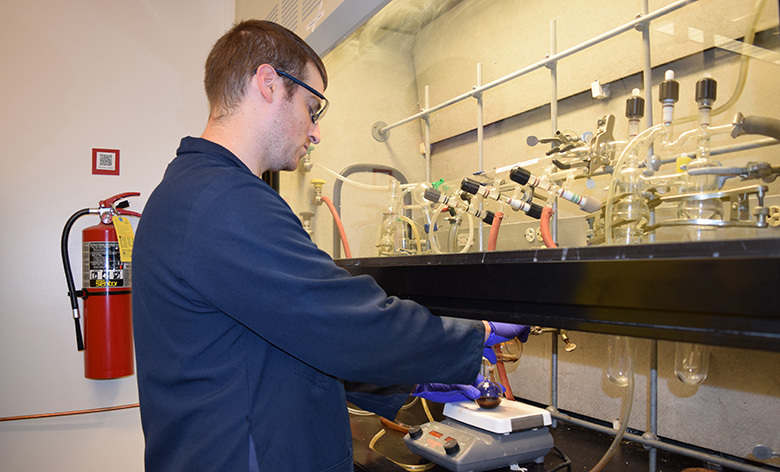 Chemistry Research Associate Jeff Myers demonstrates an experimental procedure inside a fume hood. Fume hoods present a unique opportunity for UVA to reduce greenhouse gas emissions while informing researchers of better safety practices, but it depends on lab personnel “shutting the sash”. The sash is a moveable protective window that allows researchers to see into the fume hood as they work with hazardous chemicals. When it is not being used, professional associations specializing in lab safety consider it best practice to keep the sash in the lowest possible or “closed” position, shielding room occupants from unexpected chemical reactions and in some cases conserving airflow2. Nevertheless, it remains common for hoods to be left open out of habit or as a result of misinformation. UVA’s Office for Sustainability and Green Labs Program reached out to the Office of Environmental Health and Safetywho helped develop our first “Shut the Sash” competition checklist, a proven strategy that has been effective for promoting best practices at other Universities3,4. 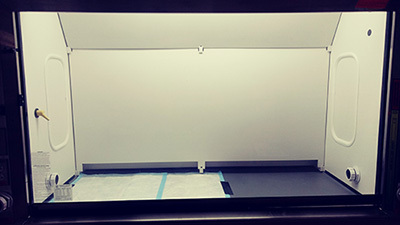 Items on the form asked competitors to snap “before” and “after” photos showing a cleaner more organized hood with a new “Shut the Sash” arrow sticker reminding users to close their hoods. Competitors also answered a series of educational multiple choice questions and watched a video about sustainable research practices. To avoid giving an unfair advantage to hood-rich labs, the checklist provided unlimited opportunities for labs to share fume hood resources with other campus research groups, so anyone could win! All participants were allowed the month of October to work through the checklist and improve their fume hoods. Arts and Sciences competition winners, the Harman lab submitted many photos of their cleaned fume hoods. Out of 18 registered labs and 51 fume hoods distributed among five different university research buildings, two champions earned prizes for their efforts. From the College of Arts and Sciences’ Chemistry Department, the Harman Labsubmitted photos showing cleaner, organized, and safer hoods. The Agaisse Lab in the School of Medicine’s Microbiology, Immunology, and Cancer Biology Department also submitted photos and despite not having many hoods in the competition, their extra efforts set them apart. 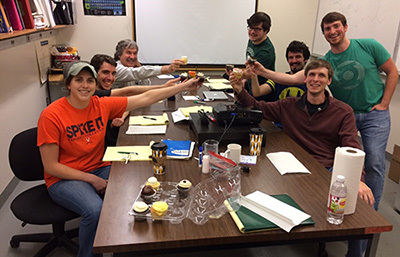 The Office for Sustainability sent both labs assorted cupcakes from Sweethaus Bakery and Green Labs beaker mugs for all participating lab members. Green Labs is also excited to recognize two Honorable Mention awardees: the lab with the best “before” and “after” photo submission was the Biology Department’s Hirsh Lab and the lab earning the most points for information sharing was Biochemistry and Molecular Genetic’s McConnell Lab. Having only one fume hood in the competition didn’t deter the Agaisse Lab; their extra actions earned them enough points for a win! The real victory, of course, is our collective energy savings and safer working conditions resulting from the knowledge shared by Environmental Health and Safety. To quantify these gains, UVA Systems Control tracked the average sash position on fume hoods in the Physical and Life Sciences Building (PLSB) and the Chemistry Building to reveal whether or not the campaign was effective. In the two months leading up to the competition (August and September), fume hoods were left on average a quarter of the way open in PLSB and just over one tenth of the way open in Chemistry. In the following two months coinciding with the Green Labs competition, PLSB sash position improved by 32% while in Chemistry there was a 10% improvement. With these sash position trends, UVA could realize savings of $4800 in annual utility costs for PLSB. However, if lab occupants in PLSB maintained their sashes at the same height as Chemistry (10% open) we could see savings close to $10,000 per year! The Hirsh Lab’s Jaqueline Parker performed well, submitting the best “Before” and “After” photos of her lab’s improved fume hood. The McConnell Lab celebrated an honorable mention award for sharing the most information about safe and sustainable fume hood practices with neighboring labs. UVA Green Labs is hosting more sustainable lab competitions in the coming spring semester. The International Laboratory Freezer Challenge coordinated by My Green Lab and the International Institute for Sustainable Laboratories will take place between January and April 2018, but labs can sign up for the Freezer Challenge today! Another springtime competition, Recyclemania, will reward labs for taking action to reduce waste in their research operations and is set to run for eight weeks beginning February 4th, 2018. To register for these programs or to learn more about UVA Green Labs, visit us on the web or email Green Labs.